The Samahang Pisika ng Pilipinas (SPP) Physics Conference is an annual venue for its members and students to share the results of their research and to form and strengthen collaborations with their academic, government, and industry partners. 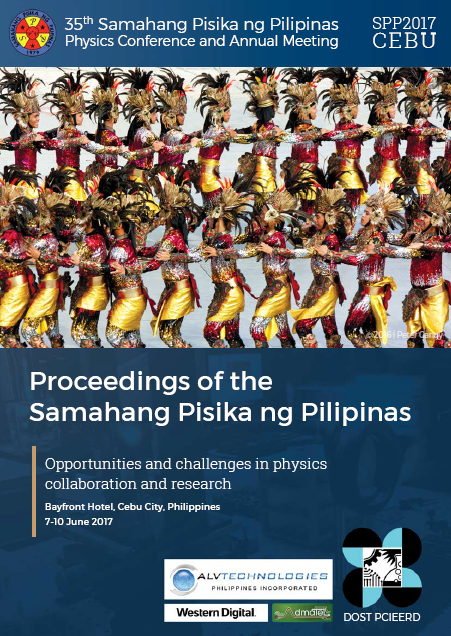 Contributions to the Conference are full-length scientific articles that provide a revealing cross-section of the state of physics and applied physics research in the Philippines. The Proceedings of the Samahang Pisika ng Pilipinas is a collection of these peer-reviewed articles and the Samahan strives to ensure the quality and accessibility of the work it distributes. In its 35th Conference the Samahan has taken advantage of several open-source and collaborative platforms to adopt and implement an open-access publishing model from manuscript submission to print and online delivery. The SPP Editorial Board is composed of physicists that oversee the review process of all submissions to the Conference. They seek the professional evaluations of scientists, engineers, and educators from the SPP Pool of Reviewers who are experts in their corresponding technical fields. The SPP Secretariat and Publication Committee members offer technical support during the publication process and facilitate the production of the Proceedings and this Conference Handbook. The SPP gratefully acknowledges their invaluable contributions to the continued development of the Samahan and Philippine physics as a whole. S. Paperview. Editorial and Finance Teams 2017, Proceedings of the Samahang Pisika ng Pilipinas 35, SPP-2017-E1 (2017). URL: https://paperview.spp-online.org/proceedings/article/view/22.